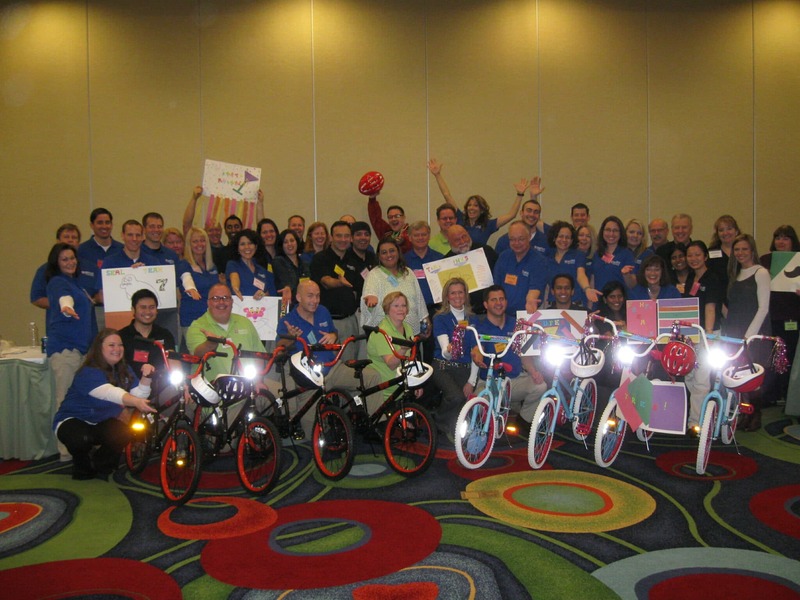 Heartland Payment Systems of Plano, Texas, just outside of Dallas, hosted the Build-A-Bike program at The Cascades Event Center in The Colony, Texas for their first inaugural Product Integration Summit; the theme for 2012 is “Knowing Your Customers”. In 1997 Heartland Payment Systems opened its doors with a modest plan: to provide fair, honest and fully disclosed payments solutions to help businesses prosper. Today, they process more than 11 million transactions a day and over $80 billion a year. Big or small, each of our clients enjoys the same benefits, a real person who will answer the phone anytime there’s an issue and not hang up until it’s resolved. The group started the morning with a brief overview of the Summit then they came together for a series of exercises to get to know one another since many of them haven’t met prior to the summit. Kent Raymer oversees the Plano, Texas office and along with Duane Greene the Technical Publications Manager they brought this summit together. We started the event in the morning and through a series of activities, clue solving and team work, they built bikes. The Build-A-Bike event teaches teamwork skills through a series of challenges which the teams are to complete. The tasks encourage the teams to think outside the box to come up with solutions. While they are learning to work efficiently as a team employees were also having fun. The overall lesson is that everyone works together to reach the same goal. The event was too early to have the children accept the bikes so before they broke for the day the charity representative and I went back to The Cascades Event Center. The representative with the YMCA spoke to the group about the organization. Then I introduced the children to the group, they were surprised as the kids came running in. Many photos taken, each team had a picture taken with the kid they built the bike for. The kids were riding their new bikes around the room, enjoying snacks and some of the parents of the children came to the event and there were some tears as the parents thanked them for the new bikes.